One of the biggest automotive pet peeves we have is a rear-view mirror loaded down with visibility-obscuring low-hanging tchotchkes. A Federal court in Michigan has upheld the long-standing law against them, proving government occasionally works. 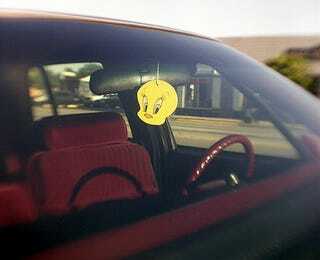 The challenges to the statute came from an idiot who was pulled over for a Tweety Bird air freshener hanging from his mirror, apparently put there to cover the odor of an open pint of Hennessy, cocaine, a loaded gun, the lack of drivers license and the stench of stupidity, which police found after a search of the car. Following conviction on drug and firearms charges, the idiot challenged the circumstances of the initial arrest, claiming the law against review mirror junk was unconstitutional, which is what initially gave officers probable cause.